We watched Rachel Ray (30-Minute Meals) last night and she was making some kind of veggie soup and an olive frittata and since I didn't have anything else planned, I decided to chop right along with her. Well, needless to say, she's a way better chopper than I'll ever be and I was behind even tho I didn't have zucchini and I wasn't making the fresh ginger tea. Oh well, the frittata turned out not half bad (tho I made my own addidions/omissions) and the soup was pretty good too. 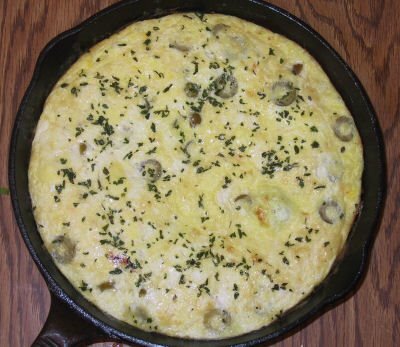 Here's a pic of the frittata, fresh out of the oven. It was basically 6 eggs, 1/2 tsp salt (maybe a little less), a couple handfulls of pitted green (not Spanish! these are homestyle and very mild) olives, sliced, a couple good sized scoops of cottage cheese, and a sprinkle of parsley on top. I cooked it on the stove till it just started to set. Then I transferred it to a 425° oven till puffy and toothpick-done. I don't think the kids were as impressed as I was, but I liked it. Then again I'm fairly easy to please when it comes to food and I do have the added advantave of having adult tastes. Her recipe called for roasted red peppers which would have been really nice if I had had them. Oh well... I have to work with what I have.